What’s the Difference Between the PlayStation 4, PlayStation 4 Slim, and PlayStation 4 Pro? Sony’s PlayStation 4 has been out since 2013, but there’s a pair of new, updated players on the stage: The PlayStation 4 Slim and PlayStation 4 Pro. But what’s the difference, and which one should you buy? Figuring out which PS4 to buy can be interesting—even more if you already have a PS4 and are considering an upgrade to the new PS4 Pro. The good news is that the PS4 and PS4 Slim are, for all intents and purposes, the same machine for the most part, and all three machines will play the same games. Some may play them with extra features or better graphics, though, so let’s talk about the main differences. Ah, the original PlayStation 4. It’s hard to believe this machine is already nearly four years old, but it has actually aged quite well. There are, however, some key specs that are starting to get a little long in the tooth, which is precisely why Sony decided a new Slim model was necessary (just like it did with the PlayStation 2 and 3 in the past). Before we get into that, however, let’s talk about the PlayStation 4 itself. Originally launched at $400, it was a state-of-the-art machine for its time, featuring a graphics processor that made the preceding PlayStation 3 look like, well, a last-gen console. It can output true 1080p graphics even in the most intense games, where its predecessor was often limited to 720p. 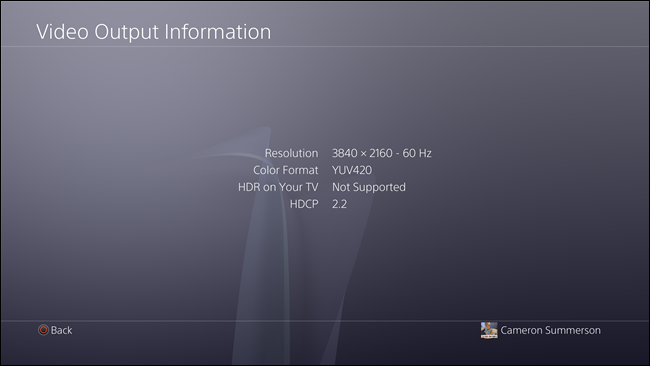 Thanks to a recent update it also supports HDR on compatible TVs, which is a nice enhancement that keeps the original model more in line with the new Slim and Pro models. It also featured a new controller design with the DualShock 4, which introduced a touchpad and replaced the traditional Start/Select buttons with new Share and Options buttons. 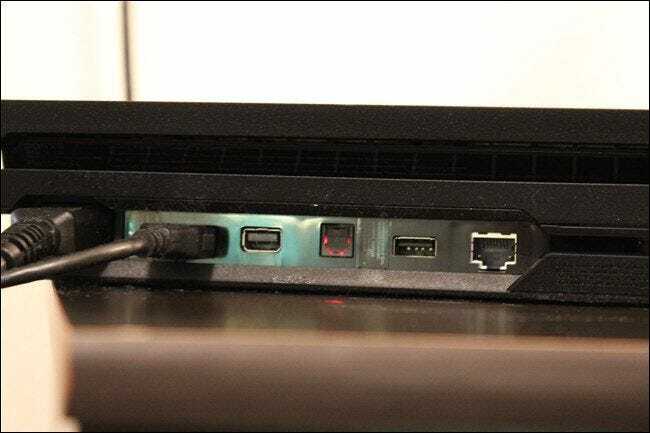 It also allowed the controllers to be charged when the console was in Sleep Mode, which was a huge omission on the PlayStation 3. Overall, the PS4 was an excellent console for its time, and a worthy successor to the PlayStation 3. But like I said earlier, some of its features are getting a little long in the tooth, which is the whole reason for the new Slim model. As its name suggests, the newest version of the PS4—with a list price of $300, but often available for less—is a smaller, slimmer, and overall more minimal version of the PS4—at least on the outside. It does, however, bring updates to some of the PS4’s more outdated specs, which was honestly needed at this point. 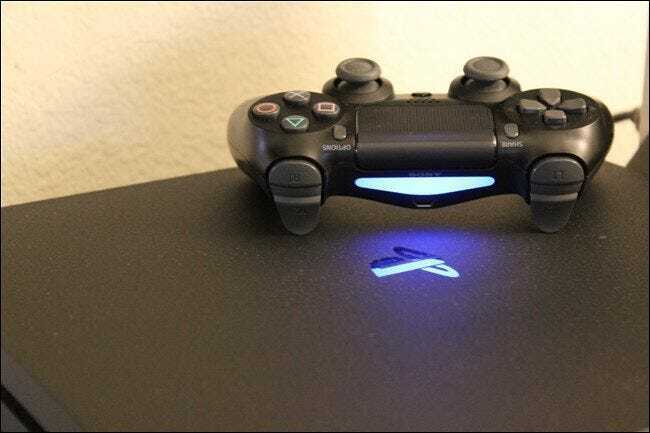 First, and what I personally feel is the biggest improvement, is the Wi-FI: where the original PS4 only supports 2.4GHz b/g/n networks, the PS4 Slim has both 2.4GHz and 5GHz support, as well as adding Wi-Fi AC to the mix. In other words, it supports all modern network configurations for faster and more reliable Wi-Fi, provided your router supports those same standards. The Slim model also bumps the Bluetooth connection from the long-outdated 2.1 protocol to Bluetooth 4.0. The USB ports have been updated to the newer USB 3.1 standard, but Sony also removed the optical audio port from the updated model to fit its slimmer size. That means all audio has to be routed through HDMI for those with home entertainment systems. For most users, this probably won’t matter, but optical audio can be useful in some situations. When it comes to storage, the original PlayStation 4 was limited to 500GB out of the box, where the Slim comes in both 500GB and 1TB options. That extra 500GB will go a long way. Past this handful of hardware differences, the Slim is otherwise identical to the original model—the graphics processor and RAM, for example, are the same. The real update there is in the Pro model, which takes everything to a new level. The PlayStation 4 Pro ($400) is the big dog of Sony’s “new” lineup, offering more than either of the other two models—including 4K and HDR support for games and video. 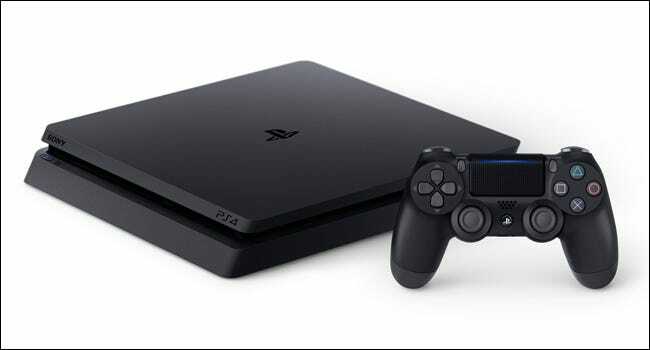 The overall form factor of the Pro is a bit larger than the original PlayStation 4, though not by much—about 13 percent—it is, however, roughly 43 percent larger than the Slim model, not to mention more expensive. It makes sense, though, because it packs a lot more under the hood than the other two models. For starters, it offers three USB ports instead of two (all of which are USB 3.1). Just like the other two, there’s a pair of ports on the front, but now it also offers one in the back—great for USB storage. Sony also updated the HDMI port on the Pro to HDMI 2.0. The older HDMI 1.4 standard (which is on both the original PS4 and Slim models) limits 4K content to 24fps (frames per second), where HDMI 2.0 bumps this up to 60fps—this is crucial for being able to play games in 4K. This newer HDMI standard also features HDCP 2.2, an updated form of copy protection which allows services like Netflix to output 4K content. All that said, there is one silly omission here: the Pro can’t play 4K Blu Rays. It’s unclear whether this is a software or hardware limitation, so we can’t expect that some software update will fix this in the future. It’s very, very dumb. Since this is the 4K model, Sony also bumped the GPU (graphics processing unit) up a notch or two. This make a lot of sense, because 4K resolution is literally four times larger than 1080p, which means there are more pixels to push. The more pixels the unit needs to push, the harder the GPU has to work to do it. The Pro offers an additional gigabyte of RAM over the other models: instead of just 8GB or DDR5 RAM like the other two, it also has 1GB of slower, DDR3 RAM for non-gaming tasks. Instead of using the 8GB of “gaming” RAM for background tasks like Netflix or Spotify, the Pro offloads these much less complex tasks to the slower RAM, making more of the “gaming” RAM available for, well, games. It’s a clever setup that should make the overall system more responsive and games play a little better. It’s also worth pointing out that just because all three PS4s are using DDR5 RAM doesn’t necessarily mean they perform equally. According to Polygon, the DDR5 RAM in the Pro clocks at 24 percent faster than the original PS4: 176 GB/second vs 218 GB/second. Again, a marginal bump that will go a long way in increasing the lifespan of the Pro, helping it to stay relevant until Sony releases its next-gen console some years from now. Beyond this, all the same upgrades available in the PS4 Slim—5GHz and AC Wi-Fi, Bluetooth 4.0, etc.—are all available in the Pro. It also comes standard with 1TB of storage—no 500GB option for this beasty. Finally, I want to touch on software. While the Pro’s software is mostly the same as the other models (and should continue to be in the future), there is one feature worth talking about: Boost Mode. Boost Mode? More like Beast Mode. 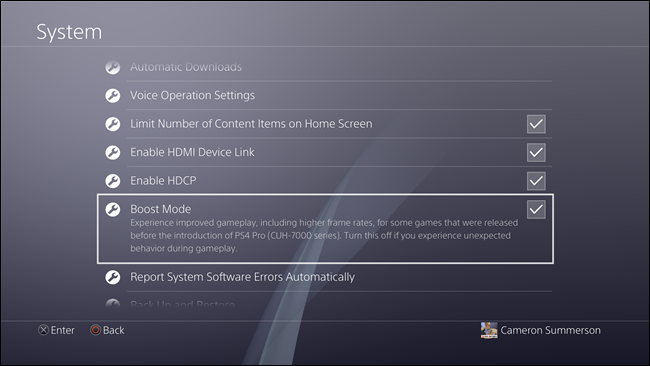 Boost Mode is an exclusive feature for the PS4 Pro that was released with the 4.50 system software. Basically, this feature allows existing PS4 games to put that extra GPU power to good use, which can dramatically improve graphical performance. Or, in simpler terms: it makes existing games look better and play smoother, even if they weren’t designed for the PS4 Pro. And this isn’t just something that applies to games that have already been updated to support the PS4’s increased resolution, either—this is for nearly all PS4 games. So, if a game pushes the PS4 to its limits in terms of frames per second, it should be able to zip right along at 60 fps on the Pro with Boost Mode enabled. That said, some games are locked to 30fps regardless, so Boost Mode won’t do anything to improve that. It’s a software limitation within the game itself. Top: Original DualShock 4; Bottom: New DualShock 4. Look at that light bar! Apart from the new consoles, there are some minor changes in the new DualShock 4 (note: both controllers have the same name, so there’s no differentiation there). Mostly, the newer model has a light bar not only on the back of the controller, but also just above the touchpad. This makes a lot more sense to me, as it’s now a player-facing feature and not just a novelty item. 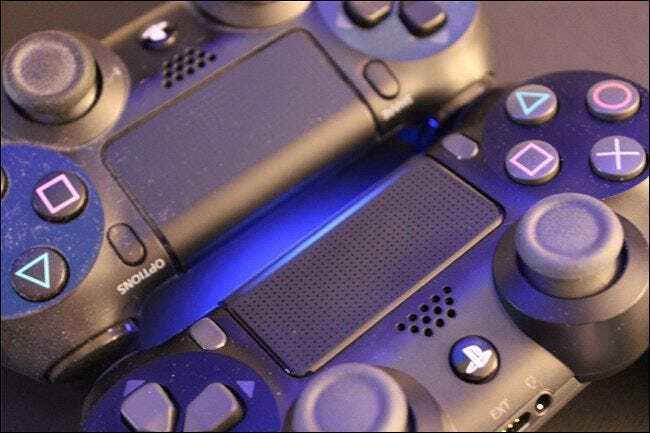 The newer model also features USB communication, so you can play games either wirelessly or over USB—an option that wasn’t available on the original DualShock 4. Otherwise, the rest of the specs are identical. The new DualShock 4 controller comes with the PS4 Slim and PS4 Pro, but works on all three systems. Not everything is black and white, so you can’t just say “here are the specs, and here is what’s under the hood” and expect that to be the entire conversation—that’s only half the story. The rest of the things worth considering are more theoretical or even personal in nature, especially when you consider cost. The PS4 Slim officially costs $300, but you can often get it for less, and often in a bundle—this PS4 Slim Uncharted Bundle is going for $255 at the time of this writing. The PS4 Pro, on the other hand, is $400, with no games included—so there’s a bigger difference in cost than it may seem at first glance. So what do you get for that extra money? First, let’s talk about this whole 4K thing. Is a 4K TV necessary to enjoy a PS4 Pro? No, but it is nice. The PS4 Pro is still a decent improvement over the other two consoles on a 1080p TV, thanks to the hardware improvements and boost mode. 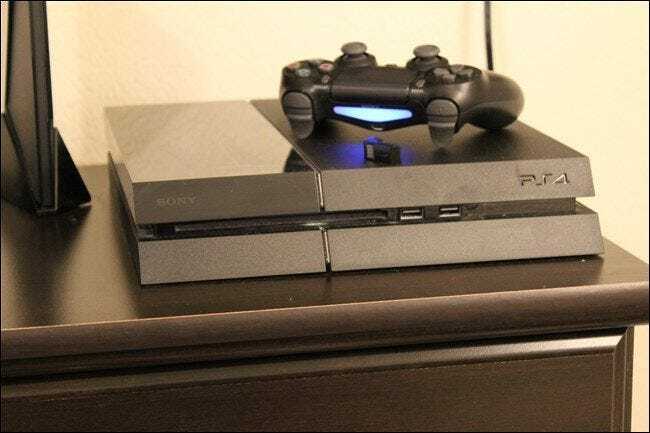 If you’re in the market for a PlayStation and don’t already have a PS4, then you should absolutely buy the Pro provided it fits into your budget. Not only is it noticeably better, but it’s going to have the longest life—while the other two models will undoubtedly feel dated before Sony releases its next-gen console (whenever that may be). The Pro far more future-proof, making it a much better purchase decision right now, even if you don’t have a 4K TV (yet). If you have a 4K TV or plan on getting one, the difference is definitely noticeable. Even on your existing 4K TV the enhanced performance and Boost Mode make a big difference, but you’ll really like it once you upgrade to a 4K screen. The Wi-Fi performance is significantly better. Honestly, this was the feature that pushed me over the edge. The Wi-Fi performance on my 2013 PS4 was so crummy most of the time I couldn’t even use PlayStation Now to test game streaming—with the Pro’s improved Wi-Fi performance and 5GHz support, however, that changed. That’s a huge point that I feel has gone mostly under the radar, and probably the Pro’s most underappreciated feature at this point. Boost Mode is legit, son. If you love playing games on your PS4 now, you’ll love all those same titles even more on the Pro—even if they haven’t been updated to support the Pro’s higher resolution. Boost Mode makes everything smoother and faster, which makes gaming more fun. This is definitely a feature you’ll love and a solid reason to want to upgrade to the Pro—even if you’re playing on a 1080p TV. Don’t worry about the upscaling thing. I know a lot of people are somewhat concerned about many games not playing in “true” 4K. I’ll tell you right now: don’t worry about it. The upscaled 4K content still looks great, I promise. Of course, it’s really up to you if you can or can’t justify the upgrade. 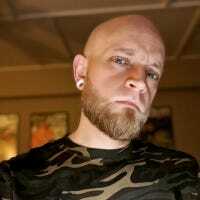 I will tell you this: if you don’t have a 4K TV and are happy with your current PS4, don’t upgrade yet. Give it some time—you’re not missing out on anything super special right now, and if you wait long enough some sweet bundles will undoubtedly roll out, saving you a decent amount of money. I imagine we’ll see some nice bundles around the holidays. If you don’t have a PS4, go for the Pro (provided you can fit it into your budget). If you have a 4K TV and a PS4, it’s definitely worth the upgrade, but consider holding out for a PS4 Pro bundle to roll out. If you have a 1080p TV and a PS4, the return won’t be nearly as dramatic as it is for users with 4K TVs, so I’d suggest waiting for a bundle. Give it some time—the value will be much higher down the road a ways. I know, it’s a lot to take in—like I said, there’s a lot more to it than you may realize at first. Hopefully I’ve been able to help parse some of the details and point out things you haven’t considered. And for what it’s worth: I have zero regret in upgrading to the Pro. I loved my PS4, and I love the Pro even more. It was worth every penny of my hard-earned dollars.